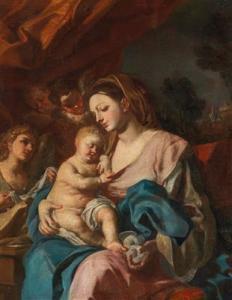 Find artworks, auction results, sale prices and pictures of Francesco Ciccio Solimena at auctions worldwide. 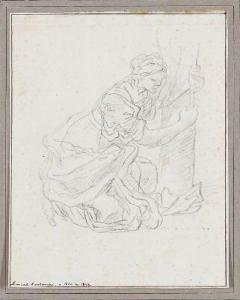 A kneeling woman. Unsigned. Black chalk on paper. Sheet size 198×156 mm. 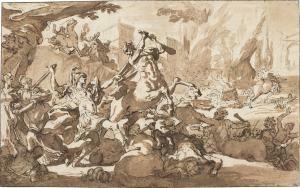 The present drawing is after the original by Solimena in Gabinetto Disegni e Stampe degli Uffizi (inv. no. GDSO17207 F). 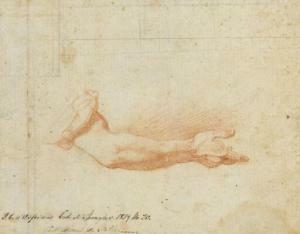 Provenance: Collection Solimena (Inscribed Collection de Solimena on the reverse) (Not in Lugt). Johan Conrad Spengler (1767–1839) (Lugt 1434), his estate sale 1839, no. 372–396. Here purchased by Benjamin Wolff (1790–1866) (Lugt 420). Thence by descent.